“Vincent van Gogh’s Paintings of Olive Trees and Cypresses from St.-Rémy” by Vojtich Jirat-Wasiutyski and “A Modern Gethsemane: Vincent Van Gogh’s Olive Grove” by Joan Greer. Van Gogh scholars Vojtěch Jirat-Wasiutyński and Joan Greer present comparative views – comparative in the sense that some aspects differ and some also agree – of Vincent Van Gogh’s production of olive-tree related paintings during his slightly-longer-than-one-year stay in Saint-Rémy beginning in May 1889 in the respective articles “Vincent van Gogh’s Paintings of Olive Trees and Cypresses from St.-Rémy” and “A Modern Gethsemane: Vincent Van Gogh’s Olive Grove.” While both pieces emphasize the storied Biblical association of olive trees and olive groves and explore various aspects of Van Gogh’s perception and representation of himself as a Christic figure, Greer brings forward some interesting arguments concerning Frédéric Salles, a Reformed Church minister who visited Van Gogh at Saint-Paul-de-Mausole and became involved with the artist and his family, and about the possibility of Van Gogh’s intentions around these paintings to engage in a sort of conversation with Emile Bernard and not-so-subtle reproach to Paul Gauguin about observation vs. memory studies and religious iconography. Jirat-Wasiuty?ski proposes as an aside that Van Gogh’s cypresses constitute references to Egyptian art (as invocations of immortality) and that the olive series also furthered Van Gogh’s earlier pursuit of typology and physiognomy in attempting to locate the nostalgic and essential in Provencal culture. Finally, Vojtěch Jirat-Wasiutyński makes some points about Van Gogh’s identification olive and cypress trees not as religious symbols but as relatable organisms. “Both trees were treated as tough outcasts, relegated to marginal land,” Vojtěch Jirat-Wasiutyński observes on page 650. Vojtěch Jirat-Wasiutyński presents about the Egyptian obelisk connection that I would like to believe, but Van Gogh has shown previous, contradictory disdain for artifacts and architectural elements from the ancient world throughout his painting career. Perhaps Van Gogh had a change of heart, or found simple visual interest in the formidable trees. In any case Cypresses (1889) is my favorite work from this period. 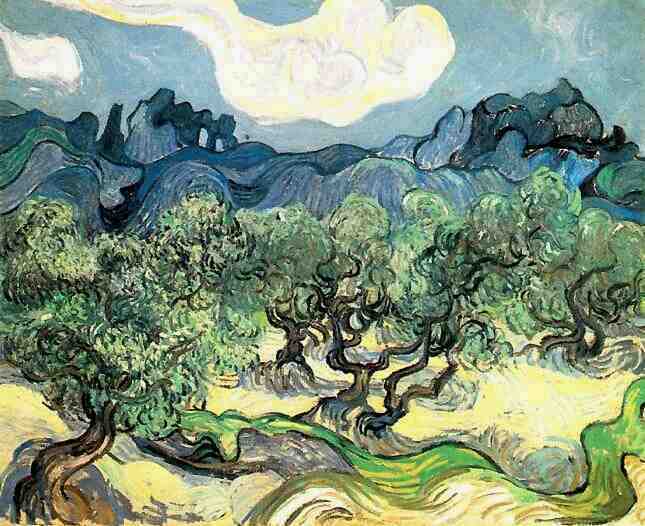 However I cannot help but see the possibilities in Olive Trees with the Alpilles in the Background (1889). In only ten years, Picasso will be in Paris, and (like Der Blaue Reiter artists) encounter Van Gogh’s work in person. Olive Trees… shows many qualities – maybe even more than Cezanne from this time – of the dematerialization of objects and the animation of the landscape visible as inspiration to all the painters of the coming age. Vojtěch Jirat-Wasiutyński. “Vincent van Gogh’s Paintings of Olive Trees and Cypresses from St.-Rémy” The Art Bulletin, Vol. 75, No. 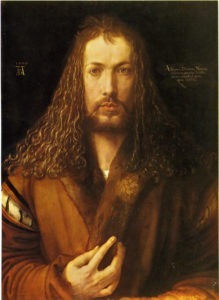 4 (Dec., 1993), 647-670. Greer, Joan. “A Modern Gethsemane: Vincent Van Gogh’s Olive Grove.” The Van Gogh Museum Journal, 2001. 106-117.